More than 1.5 million Michigan residents and potentially more than hundreds of sites nationwide—and counting—have PFAS-tainted water. 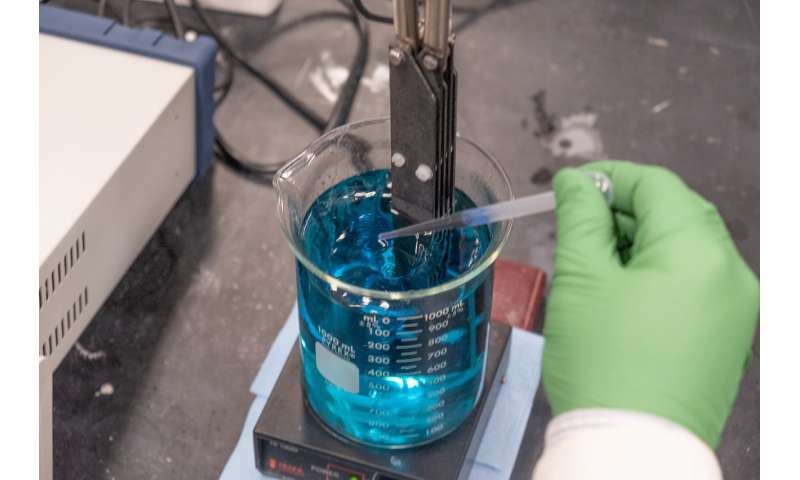 Michigan State University-Fraunhofer USA, Inc. Center for Coatings and Diamond Technologies (MSU-Fraunhofer) is developing a scalable treatment option for PFAS-contaminated wastewater. PFAS, or per- and polyfluoroalkyl substances, are colloquially known as "forever chemicals" because they are so difficult to break down. They are found in water supplies wherever flame retardants, waterproofing or vapor suppressants are used. PFAS can be absorbed through direct contact (drinking, bathing, swimming) or indirectly (eating meat or vegetables that have been exposed to PFAS). The MSU-Fraunhofer team has a viable solution to treat PFAS-contaminated wastewater that's ready for a pilot-scale investigation. The electrochemical oxidation system uses boron-doped diamond electrodes. The process breaks down the contaminants' formidable molecular bonds, cleaning the water while systematically destroying the hazardous compounds. "EO, or electrochemical oxidation, is a simple, clean and effective method for destruction of PFAS and other co-contaminants as a complementary procedure to other wastewater treatment processes," said Cory Rusinek, electrochemist at MSU-Fraunhofer. "If we can remove it from wastewater, we can reduce its occurrence in surface waters." Wastewater treatment is a multi-step process to remove contaminants or add beneficial chemicals to create safe, dischargeable water. MSU-Fraunhofer's EO system has advanced to the laboratory scale, successfully removing PFAS from gallons of tainted water. While many electrodes have been investigated in EO, boron-doped diamond electrodes have shown the most promise for contaminant degradation with a number of studies showing its ability to degrade PFAS. Depending on its success and other advances, it's possible that this process could eventually become a complementary component of a municipal drinking water system. "Fraunhofer's mission is to bridge the innovation gap between basic research and the industry," he said. "MSU-Fraunhofer's combined expertise in diamond fabrication, electrochemistry and reactor design creates a diverse team of professors, scientists, engineers and students capable of addressing this emerging, yet significant, issue."